The deadline for Washington DC mayor, Vincent Gray, to act on B19-90, the bill to move both the presidential primaries and the primaries for district offices to the first Tuesday in April in presidential election years is tomorrow, Friday, April 29. The DC Council passed the bill back on April 5 and transmitted the legislation to the mayor on April 14. After that point, the mayor has three options: 1) sign the bill in which case it becomes an act, 2) do nothing in which case it becomes an act, or 3) veto the bill in which case the council can choose to override the veto. Given that the mayoral review period has almost concluded, the most likely action -- inaction, really -- is for the mayor to do nothing, thus enacting the law. Now, technically, the act would then go to the US Congress for review as well, but on non-controversial legislation like this, that should prove to be nothing more than a formality. That has been the case in the past anyway. For our purposes here at FHQ, DC will move to the April 3 line on the calendar should Mayor Gray fail to act on B19-90 tomorrow. North Dakota Democrats have made their choice for the date of the party's 2012 caucuses and attendant to that is an update of the 2012 presidential primary calendar. As was the case with the maps from past cycles, the earlier a contest is scheduled in 2012, the darker the color in which the state is shaded. Florida, for instance, is a much deeper shade of blue in January than South Dakota is in June. There are, however, some differences between the earlier maps and the one that appears above. 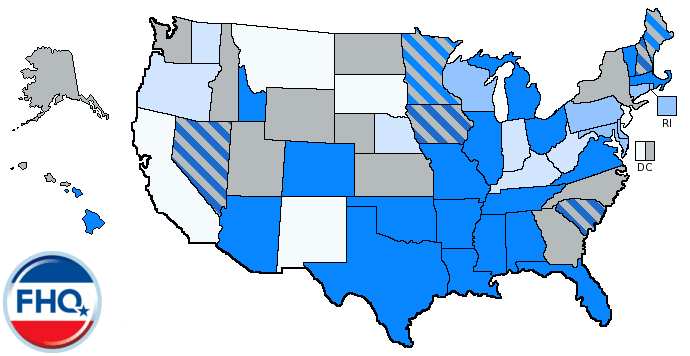 The states where legislation to move the presidential primary is active are two-toned. One color indicates the timing of the primary according to the current law whereas the second color is meant to highlight the most likely month to which the primary could be moved. [With the exception of Texas, the proposed movement is backward.] This is clear in most states, but in others -- Maryland and Tennessee -- where multiple timing options are being considered, the most likely date is used. Here that is defined as a bill -- or date change -- with the most institutional support. In both cases, the majority party leadership is sponsoring one change over another (February to March in Tennessee and February to April in Maryland). That option is given more weight on the map. Kentucky is unique because the legislation there calls for shifting the primary from May to August. As August is not included in the color coding, white designates that potential move with the May shade of blue. Georgia, too, is unique. The state legislature is considering a bill to shift primary date-setting power from the legislature to the secretary of state. The effect is that the Peach state has a dark blue stripe for its current February primary date and a gray stripe to reflect the fact that a change from that based on the bill in question would put the future 2012 primary date in limbo until December 1 at the latest. 5 The Colorado Democratic and Republican parties have the option to move their caucuses from the third Tuesday in March to the first Tuesday in February. 6 The law in New Mexico allows the parties to decide when to hold their nominating contests. The Democrats have gone in early February in the last two cycles, but the GOP has held steady in June. They have the option of moving however. The Alabama state House today voted nearly unanimously to move both the presidential primary and those for state and local office to March. By a vote of 99-1, the House passed HB 425 which would shift the presidential primary back from the first Tuesday in February to the first second Tuesday in March while the primaries for state and local offices would move to the same March date from the traditional first Tuesday in June date. This bill replaced an earlier bill -- HB 32 -- that sought to move the presidential primary back to June to coincide with the primaries for state and local offices as a cost savings measure. Those costs are still saved under the new provision by holding both sets of primaries concurrently in March. The Republican-sponsored legislation now heads over the Senate where it has until mid-June to be considered prior to the legislature adjourning for the year. NOTE: As this bill has now passed the House and more than seemingly replaced Rep. Clouse's original bill, Alabama will be reshaded on the map on the 2012 presidential primary calendar. The Oklahoma Senate today -- April 25 -- passed HB 1614, the second House bill that would change the date on which the Sooner state's presidential primary would be held in 2012. There are a couple of notes to be made about this particular bill in the context of the series of bills that would accomplish the same task. Unlike HB 1615, which passed the Senate earlier in the month, this is a much simpler bill. HB 1614 has the sole purpose of moving the presidential primary from the first Tuesday in February to the first Tuesday in March. HB 1615, on the other hand, would make the same change to the presidential primary date but would also bump the primaries for state and local offices up from the last Tuesday in July to the last Tuesday June and shift the filing deadline from May to March among other things. The second matter is that while HB 1615 passed both the House and Senate, it passed the upper chamber in an amended form and had to be sent back to the House for consideration. HB 1614 has now passed both chambers in the same form and can now be enrolled and sent off to Governor Mary Fallin's desk for the Republican's perusal and likely approval. 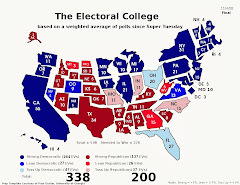 Oklahoma, like Tennessee, is under unified Republican control after the 2010 elections and has seemingly been on course since the legislature convened to move the state's primary back into compliance with the altered national party rules -- reflecting the national parties' desire to the shift back the beginning of the presidential nomination process. On Monday, April 25 the Tennessee state Senate considered and passed HB 612, the state House bill designed to shift the Volunteer state's presidential primary from the first Tuesday in February to the first Tuesday in March. Simultaneous to that, the Senate moved its own version of the bill (SB 599) to the dead bill file. That move clears the way for the House version -- now passed by both chambers -- to move on to the governor's desk. And with the Republican-controlled legislature having overwhelmingly passed the bill (unanimously in the Senate, 31-0), there is likely to be little resistance from Republican governor, Bill Haslam. If signed, the law would bring Tennessee into compliance with the national party rules regarding the timing of delegate selection events. It is bothersome that the same stories keep getting rehashed and continually have to be shot down. Several of these revolve around Mitt Romney, Iowa or some combination of the two. Though Mitt Romney has not returned to Iowa (or South Carolina), the stories of the former Massachusetts governor skipping the Hawkeye state have largely and thankfully died down. [FHQ doesn't know whether to attribute that to the reality of Romney's campaign strategy -- less emphasis on Iowa -- having set in with the press or what.] But various sources, now including New Hampshire Republican Fergus Cullen, keep returning to the Iowa-isn't-important well, assuming that it runs deep when the reality is that it is close to dry. First of all, the fact that the nominal frontrunner is not making regular visits to Iowa certainly gives the impression that the 2012 Republican caucuses in the Hawkeye state are less meaningful. The other candidates, however, aren't behaving as if Iowa is anything other than one of the first states in the presidential nomination process. [I'll focus on candidate visits here, but this concept could also be operationalized as money spent in the state thus far, staff hired and/or money contributed to the campaigns of 2010 candidates running for office in the state(s).] FHQ has looked at the visits data already and there is little to no evidence there that Iowa's role is shrinking. Does the state have a smaller percentage of candidate visits than in 2008? Is that being driven by Romney staying away from the Hawkeye state to this point? Are the other candidates, prospective or otherwise, following suit? Can the rest of the shift in the percentage of candidate visits from 2008 to 2012 be explained by regular cycle to cycle variation? Let's take a look. Democratic candidates in 2004 split their time pretty evenly between Iowa and New Hampshire. Out of 1660 combined candidate visits to both states only 60 visits separated the two (with Iowa having more. ).1 In 2008 the story was different. Obama's increasing viability throughout the invisible primary, coupled with visits by the then-Illinois senator and Edwards' near-permanent presence in the state forced frontrunner Hillary Clinton to have a substantial presence in Iowa as well. Visits and poll position have a way of triggering increased activity from your opponents. Of course, the point is well taken that these are data for Democrats, and there isn't an equivalent progressive movement within the Iowa Democratic Party that is pushing less "pure" candidates away in the way it has been hypothesized with Romney (and/or other candidates) and Iowa's GOP. Iowa did have a fairly healthy advantage over New Hampshire in terms of the number of visits from Republicans in 2008. No, the discrepancy between Iowa and New Hampshire wasn't as great among Republicans as it was among Democrats, but there were over 200 more visits to Iowa than New Hampshire. But that wasn't the case in 2000, the last competitive Republican nomination race, when most of the Republicans ceded the Hawkeye state to George W. Bush. The focus instead was on New Hampshire which got more attention relative to Iowa. The point here is that there are great number of factors involved in determining how much attention one of these first two states receives and it varies from cycle to cycle. Is there something to the argument that a rightward shift among the Iowa GOP caucusgoers is forcing anything resembling a revisitation of strategy from the campaigns' perspectives? Yeah, there's probably something to it, but its impact is being grossly overstated in typically very narrow examinations of the circumstances. And the fact that the nominal frontrunner is the one who isn't showing up -- especially to the level he did in his prior run -- it exacerbates the the perception that Iowa will take a backseat. 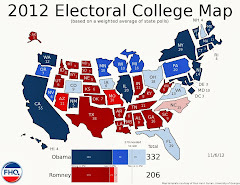 The take home message is that we shouldn't look at Iowa in 2012 in a vacuum. There is a much broader picture here beyond "Iowa Republicans are lurching to the right and the state is suffering as a result". Now, having set up the proper context through which the Iowa attention situation should be viewed, there is some evidence that Iowa is dropping off. It all depends on the window of time (in which visits occur) is used. According to the Politico 2012 Live Candidate Tracker Iowa has had 182 [prospective] candidate visits since the day after the 2008 election -- the point at which the 2012 invisible primary started. Over that same period of time, New Hampshire had 127 visits. That particular time period is going to contain visits that were made on behalf of candidates running for state and congressional office and Iowa's size and number of competitive districts would have to be accounted for as well. Even then, it wasn't as if New Hampshire was not competitive in 2010 in terms of congressional or state legislative races. But for the sake of this examination, let's close that window to include visits since the day after the 2010 elections. Over that period, Iowa had 79 visits to New Hampshire's 82; a near even distribution of total candidate visits. Since the first of the year that gap is only slightly wider: Iowa has had 68 visits and New Hampshire 78. New Hampshire, then, has had a greater number of recent visits, but the sky is hardly falling on Republicans in Iowa. Again, the composition of the state party may be a contributing factor to the discrepancy, but it is only one of many and would have a less significant impact than the usual cycle to cycle variation that we normally observe. Plus, once Romney sets foot in the state, a lot of these stories will disappear (or be re-spun as "Romney isn't paying as much attention to Iowa this time" stories). Newt's staffing up in Iowa. Sorry Roy Moore. You're getting the Buddy Roemer treatment (No separate 2012 Candidates post). For the record, as of April 18, the former Alabama Supreme Court Chief Justice formed an exploratory committee. For president. Pawlenty's message could connect in South Carolina. Chris Christie may want to move the New Jersey primary to June, and there may be a few bills that have been introduced in the legislature, but the guy behind the 2007 move to February isn't high on the idea. Florida may cast a shadow over the 2012 Republican nomination race, but it isn't "just like in 2008." Ink in the form of Governor Nathan Deal's name has yet to hit paper much less dry on the recently passed legislation to hand the date-setting authority for the Peach state's presidential primary to Secretary of State Brian Kemp. But that has not stopped some -- FHQ included -- from speculating on where the Georgia primary will end up on the 2012 presidential primary calendar. That list now includes the current GOP state party chair, Sue Everhart conceding (via the AJC Political Insider blog) "that Georgia is likely to seek an April date." Well, let's look at the factors involved in the decision-making calculus in the Peach state. First of all, Georgia Democrats will take a back seat in the process. No, the national party likely won't have a competitive nomination race at the presidential level, and that doesn't help. But neither does the fact that the party is in the minority in the state after being swept in every statewide race last year and kept in the minority in the state legislature. Really, so long as Kemp does not select -- assuming the bill is signed into law -- a date prior to the first Tuesday in March, he is not likely to hear even a peep out of Georgia Democrats. Technically, though, Kemp, a Republican, has the ability to select any date between the last Tuesday in January (the first available Tuesday 60 days following the final date on which the secretary would be able to choose a date, December 1) and the second Tuesday in June. Again, as FHQ pointed out back when the legislation was first proposed, the opening point of that window of time coincides with the date on which the primary in Florida is currently scheduled. If Florida, whether through its state legislature or the proposed bipartisan committee, continues to defy national party rules and maintains that January date, it may become a more attractive location for the Georgia primary in the eyes of Republicans in the state. It would be attractive save for two reasons. The Georgia delegation to the Republican National Convention in Tampa would be halved and the delegates from that primary would have to be allocated proportionally. Neither of those options is seemingly palatable to the state party's chair nor presumably to others within the party. Traditionally, Georgia has had a winner-take-all allocation of delegates and would go to the convention with a diluted voice of sorts. In practice all the delegates from the Georgia delegation would line up behind the presumptive GOP nominee, but they wouldn't all be Romney men or Palin loyalists or Pawlenty people. In the big picture it isn't a big deal, but to state party folks who have worked hard for a candidate it does. And yeah, they do hold some sway in the state party; a party that will elect a chair next month at the state convention. That's why one of those candidates, the current chair, Sue Everhart, is conceding that there may be an April primary in Georgia. Of course, she and the party would have to convince Brian Kemp of that first. After a Washington state House Ways and Means Committee vote late last week recommending passage, the full chamber today passed the Senate bill to cancel the Evergreen state's 2012 presidential primary. SB 5119, which previously passed the Senate, was passed by a vote of 69-28. About a third of the minority Republican caucus crossed the aisle and voted for the measure while only four Democrats defected, voting against. The bill was proposed by both the governor and the secretary of state and should be signed into law now that the Senate version has passed both houses of the legislature. The bill would temporarily suspend the primary until after the 2012 election cycle and would save the state an estimated $10 million for fiscal year 2012. Here's more from David Ammons in Washington Secretary of State Sam Reed's office. Whither Mid-Atlantic Primary? Delaware Delegate Selection Plan Indicates as Much. ...sort of. The Tennessee Senate State and Local Government Committee today unanimously passed SB 599. The bill is the equivalent of the House measure (HB 612) that passed last week. Both bills are seeking to shift the date on which the Volunteer state primary is held from the first Tuesday in February to the first Tuesday in March. After weeks of deferring action on the bill, the committee acted and passed the measure by a 9-0 vote. The measure now moves to the floor of the Senate for consideration there by the full chamber. The Tennessee legislature like the Oklahoma legislature is Republican-controlled and has similarly shown no willingness to defy national party rules and stick with their current February primary date. During its April 15 meeting the Washington state House Ways and Means Committee recommended SB 5119 for passage by the full chamber. 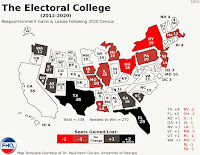 The bill previously passed the House on April 6 would temporarily cancel the presidential primary in the state; expiring and thus reestablishing the primary law as currently on the books on January 1, 2013. This bill, like its House counterpart, was jointly introduced by the governor and the secretary of state and will be signed into law if it passed the House. The Washington legislature cannot be in session past April 24, so this should be the last week before the body adjourns and must have fully considered and passed this and other bills. Thanks to Richard Winger at Ballot Access News for relaying the news out of the Evergreen state. One Mid-Atlantic primary's loss may be another Mid-Atlantic primary's gain. A few weeks ago, FHQ cited stories in both the Washington Examiner and from the AP that highlighted the discussions between Democratic officials in Maryland, Washington DC and Delaware concerning coordinated 2012 primaries. Two thirds of the so-called Mid-Atlantic primary are in place as both Maryland and DC are on the verge of officially moving to an April 3 date. Delaware, however, has yet to make any move on the state legislative level. But the Delaware Democratic Party has given the first indication that the plans for a three state primary were perhaps a bit premature. Instead of an April 3 primary, though, Delaware Democrats, according to their 2012 delegate selection plan, have chosen April 24 for the date on which the First state's presidential primary will be held. Now, a couple of notes are in order. First of all, April 24 is the date of the Pennsylvania primary; a Delaware neighbor. That would create a second April Mid-Atlantic primary, three weeks after the first. Second, no legislation has been introduced in the state legislature to move the primary in Delaware -- to either date. State party Democrats will have the final say in what happens -- adopt the state-funded primary whenever it is scheduled or hold a party-funded primary or caucus on a date of the party's choosing -- but the former will only happen if the Democratic-controlled legislature moves the date to the party's preferred date. Given the partisan overlap, that is likely but not a certainty. Until the legislature acts, the Delaware primary will remain on February 7 on our 2012 presidential primary calendar. Though the delegate selection plan is a hint at what is going on in the state, it is not indicative of the date-setting decision-making authority there. The legislature in Delaware will wrap up its legislature session in June. Hat tip to The Green Papers for the news. Did the Missouri House Up the Ante on the State Senate Presidential Primary Bill? For five consecutive weeks the Tennessee Senate subcommittee of the State and Local Government Committee has deferred action on the bills before it that would move the Volunteer state's presidential primary from the first Tuesday in February to the first Tuesday in March. And while the on again, off again calendar placement has not been repeated in the state House, the two Republican-sponsored bills to accomplish the same thing in that chamber have languished in committee since being introduced in February.1 The House, however, can now say that it has passed one of the two bills. HB 612 passed the state House on April 14 by a bipartisan vote of 91-2. Those two dissenting votes were from two Republicans. The bill now heads to the state Senate for consideration. 1 Democratic-sponsored bills to move the presidential primary to May to coincide with municipal elections have gone nowhere in committee. On Friday, Louisiana state Representative Nita Hutter (R-104th, St. Bernard) prefiled HB 509 in the state House. The legislation would move the Pelican state's presidential primary from the second (or third) Saturday in February to the first Saturday following the first Tuesday in March. This is the same date the Louisiana Republican Party State Central Committee pinpointed for the contest in a resolution it passed last month. Coming out of that meeting, the consensus among Republicans in the state seemed to place a greater emphasis on following the Republican National Committee's rules for delegate selection and avoiding the penalties (losing half the delegation) associated with a violation of the timing rules. With both chambers nearly evenly divided between the parties -- Republicans holding a narrow advantage in the House and Democrats likewise in the Senate1 -- this is not a move that Republicans can necessarily move easily through the legislature and onto the desk of Republican governor, Bobby Jindal. That said, Democrats should technically be motivated to pull the Louisiana primary into compliance with the DNC rules for delegate selection as well. And the proposed date for the primary is non-controversial enough to keep it as early as is allowed by both national parties -- avoiding penalties -- and should provide the state with an early enough position to provide Louisiana primary voters with a voice in the 2012 nomination process. In other words, it should pass barring Florida or Missouri-like shenanigans. The Louisiana legislature formally convenes on April 25. 1 Due to party switches in the state Senate since the first of the year, the Louisiana Senate is no longer controlled by Democrats. The House Committee Substitute actually calls for moving the primary back to March, not November as reported below. And so the presidential primary saga continues in the Missouri state legislature. What started out as two reasonable bills to shift the date of the Show Me state's presidential primary from the first Tuesday after the first Monday in February to the first Tuesday after the first Monday in March has seemingly devolved into a process of interchamber one-upsmanship. The Senate bill, SB 282, was amended on the floor in mid-March to anchor the primary to New Hampshire; scheduling the election for a week after the Granite state's first in the nation primary. This happened nearly simultaneous to the House passing its version of the legislation; staying true to the move to March and into compliance with the national party rules. The date of the presidential primary is moved from the first Tuesday after the first Monday in February to the first Tuesday after the first Monday in November. Now, either that "November" is a typo and it really means "March" or the House Elections Committee is proposing to move the Show Me state's presidential primary to November of this year. Call it a hunch, but I'm willing to bet that that won't sit well with Iowa, New Hampshire, South Carolina or Nevada. And Florida may have to alter the amended version of HB 1355 to allow the proposed Presidential Preference Primary Date Setting Committee the flexibility to move its primary to a time earlier than the January 3 - March 6 window called for in the bill. But that would keep the Missouri primary on February 7 -- a day after Iowa is scheduled to hold its caucuses and a week before New Hampshire is supposed to hold its first in the nation primary. [Both would move to earlier dates of course.] That's also likely to have the side effect of keeping Florida either right where it is on January 31 or bump the Sunshine state up a little closer to January 3. No matter how you slice it, the Missouri legislature is keeping things interesting. 1 And before any of that action is triggered the bill obviously has to pass on the floor of the state House as well as head back to the Senate if it passes the lower chamber in an altered form.